This parish was created in 1856 when the Bishopthorpe Estate was subdivided and sold on leasehold (previously this portion of Glebe had formed part of the parish of Christ Church St Laurence). The Rev. William Macquarie Cowper (1810-1902), the first Australian-born Anglican clergyman and a godson of Governor Macquarie was chosen as the incumbent of the new parish. The first services were taken in Cowper’s house until a church and school hall were built in 1857 at the SW corner of St Johns Road and Glebe Point Road on the site of the current Glebe Community Garden.The architect was Edmund Blacket (1817-83). The building was of Early Gothic design and, damaged by fire in 1972, was later demolished (but the sandstone blocks and other features continue to live on as an integral part of our community at 134 Glebe Point Road, Glebe as the Dabar Indian restaurant (formerly Darling Mills Restaurant). Rapid population growth from 1,055 in 1846 to over 3,000 by 1861 indicated the need for a larger church, which Blacket was asked to design and the foundation stone was laid on 15 April 1868, on the NW corner opposite the extant old church. Blacket was ably assisted by John Horbury Hunt (Canadian, 1838-1904) at this time. 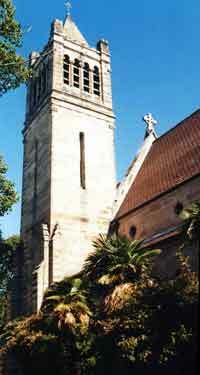 Of romanesque design in Pyrmont sandstone, the church was built by Aaron Loveride, with woodwork by Joseph Watson and was opened on 21 December1870. 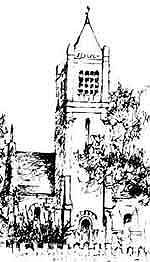 The original tower of St. John’s was built only to the height of the nave wall until 1911 when a bell tower was added by Cyril Blacket — he had also added the choir, vestry and porch in 1909. Particularly handsome, the church furniture and the pulpit were built exactly to Edmund Blacket’s sketches. The church has undergone extensive restoration to the west wall which was in danger of collapsing and the organ has also been restored. Hi, I believe my grand parents (mum’s side) got married here on 15th June 1940. Would love some more information and pictures.